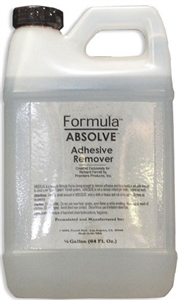 Absolve (1/2 Gallon) is a non-oily formula that is strong enough to remove adhesive and tape residue. Absolve (1/2 Gallon) is a non-oily formula that is strong enough to remove adhesive and tape residue, yet safe enough to clean your "ultra-custom" Farrell system. Absolve is not a dermal irritant per independent lab tests.